A couple of weeks ago, Sandisk, the storage vendor better known for its memory cards, announced the release of a new product, called Infiniflash, one that promises to commoditise flash within the enterprise. Sandisk claims that the enterprise storage array provides 5x the density, 50x the performance and 4x the reliability of traditional hard disk drive arrays while consuming just a fifth of the power. Make no mistake, this product is squarely aiming at the massive legacy installation of spinning hard disk drives that occupies tens of thousands of Us across data centres worldwide. What made the headlines though was the $1 per GB price point (and actually less than that). While it is more expensive than comparable consumer-grade SSD, it is actually surprisingly cheap for commercial SAN/NAS all flash arrays. According to Roland Rosenau from Sandisk, it is comparable to 15K HDD solutions, especially when taking into account the long tail total cost of ownership (beyond the initial capital expenditure). How did the company achieve that without apparently cutting corners? Well, it took the bold decision of creating its own form factor and it also makes its own flash memory (19nm for nearly two years now). Physically, the device occupies a 3U 19-inch rack containing 64 flash cards, each with an 8TB capacity. That's 512TB of SAS-connected storage or a staggering 7.168 PB in a 42U enclosure (although usable capacity is likely to be less than that). That unit doesn't come cheap though with an MSRP of half a million Dollars. The unit reaches in excess of 1M IOPS with a 1ms latency, 7GBPS throughput and consumes 250W when idle or 750W when active with eight SAS 2.0 ports. Rosenau hinted that Sandisk is also looking at on the fly compression which could bring that 42U capacity to a jaw-dropping 14PB assuming a 2:1 compression (as used by the tape industry). What will the competition do? That's another potentially very lucrative market that Sandisk would be very keen to explore. Sandisk used the popular, open source CEPH platform and has got the backing of partners such as Dell to incorporate the solution into their offerings. Switching to CEPH, Sandisk says, have resulted in a 10x improvement on block reads and 2x improvement on object read flows. In the short term, it will be interesting to see how storage vendors like Netapp and EMC react to Sandisk's announcement. 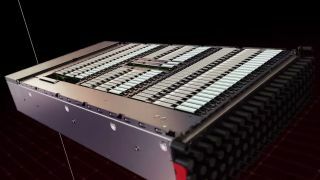 Furthermore, given that the array uses SAS-2 rather than SAS-3 or even FC, one can expect future versions of Infiniflash to significantly boost IOPS performance.